Szechuan chicken is a Spicy Chinese Chicken dish. 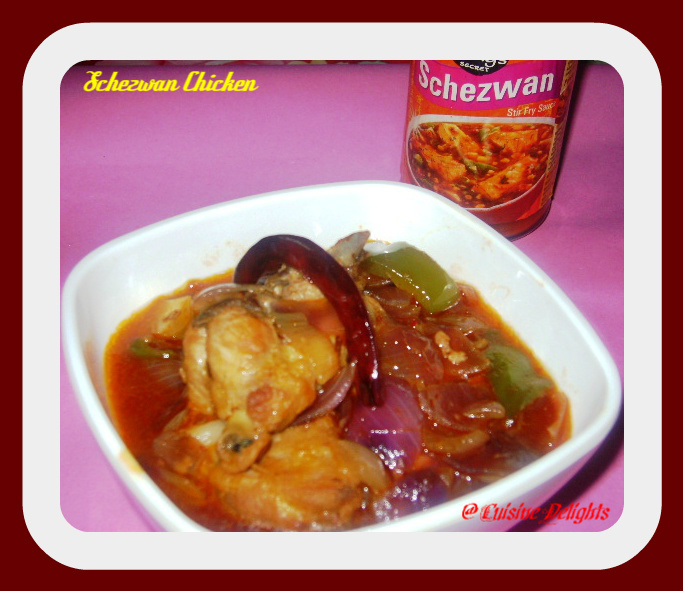 It consists of chicken bits tossed in a spicy and flavorful sauce. I know authentically you would be using Szechuan peppercorns but these can be a little hard to find in some places. I decided a light coating of cornstarch would be better as I prefer my chicken bits to be crispy. This dish is great served with chinese fried rice or noodles. First clean and wash the chicken and cut in to small sized pieces without removing the bones. Prepare a mixture of all the ingredients for marinade well. Marinate the chicken pieces in the mixture at least for 30 minutes. Now heat the oil in a deep frying pan, fry the chicken pieces to a golden colour. Do not over cook the chicken pieces. Drain and keep aside. Heat oil in an another pan, add red chilli, chopped ginger and garlic, spring onion, onion, capsicum, saute for 5-7 mins. Next add tomato sauce , chilli powder, soya sauce, chilli sauces, schezwan sauce, sugar and pepper powder, mix well together. Now add the previously fried chicken pieces to this gravy, chicken stock, simmer and cook covered for about 4 minutes. Mix cornflour with a little water and make a smooth paste without lumps. Add the paste to the boiling gravy, stir continuously till the gravy gets thicker. Stir well to coat all the chicken with the gravy. Serve hot with Indo-Chinese Vegetable fried rice / Veg Chilli Garlic noodles. 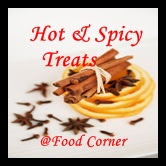 Sending this to Amy's "Hot & Spicy Treats" event, Surabhi's "Holi Hai"event, My space "COLOURFUL HOLI", Julie's "Flavors of Cuisine :Chinese "